Taipei, Taiwan – March 7, 2013 - ADATA™ Technology, a leading manufacturer of high-performance DRAM modules and NAND Flash storage application products, today introduces its Premier series SDHC, SDXC and microSDHC, microSDXC memory cards, all of which implement the UHS-I U1 (compatible with SDA 2.0 speed Class 10) specification. The new cards are designed to economically meet the performance needs of the most commonly used portable electronics. With the increasing expectations for smart phones and tablet computers to handle high definition media recording and playback, the memory cards used with these devices require higher read and write speeds than ever before. The Premier series targets those who are looking for a cost-effective entry solution to extend their device’s capacity and speed. The new Premier SDHC and SDXC memory cards are an economical option for those looking to utilize the speed of the UHS-I UI standard, with price points comparable to older class 10 cards. 64GB sequential read and write speeds are as high as 50 and 33 MB/second respectively, and random read and write IOPS are 1300 and 100. These transfer speeds allow the Premier series to easily handle the vast majority of processing and storage tasks required by today’s digital cameras. The Premier microSDHC/SDXC memory cards comply with the Secure Digital Association (SD) version 3.0 standard, at a speed class rating of UHS-I U1. Sequential read and write speeds are 50 and 33 MB/second respectively, and random read and write IOPS are 1400 and 100. They are remarkably suitable for users who enjoy high definition photography and video recording. 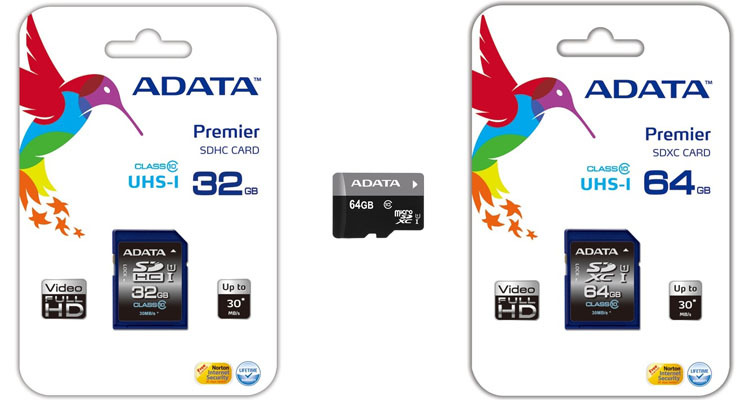 Three different packaging options are provided: single memory card, card with SD adapter, and card with reader. All Premier cards benefit from added protective features, including: X-ray proof construction, resistance to extreme temperatures, error correcting code (ECC) and write-switch protection functions.